EasyHost is Pakistan's top rated Web Hosting company, providing best in class website hosting services! .COM @ Rs.1,200/yr, .NET @ Rs.1,400/yr, .ORG @ Rs.1,300/yr, .PK @ Rs.2,200/2yrs! World's leading framework for Blogs & Corporate Websites. PHP framework for creating websites with easy to us admin portal. PHP based opensource CMS for creating websites and web applications. SMF Forums help you start your own forums in just few clicks. Fastest way to take your store online live today in few clicks. Popular platform to make an online shopping website for your products. Popular for its eCommerce functionality, security and scalability. Another eCommerce tool to make your shop get online on the website. Buy easy and affordable web hosting and get started in just 30 minutes. Get Unlimited Hosting to kick start your big website ideas without limits. Start your web hosting business using our Reseller Hosting option. 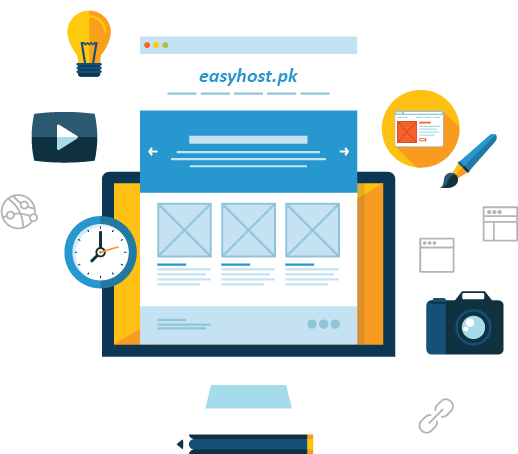 Easyhost.pk is a fast growing web hosting company in Pakistan, offering services since 2009 with experience of managing 10,000+ websites. Our services include cheap PK Domain registration, reliable website hosting and web development. Our hosting comes with hundreds of features including free domain, free site builder, rock solid 99.9% uptime, free domain name & 30 days money back guarantee - so you can have peace of mind! We have clients for Web Hosting in Karachi, Lahore, Islamabad and all other major cities in Pakistan, give us a try now! We at Easyhost ensure that we deliver the highest quality hosting service with the lowest possible price to our customers - this means you get high standard cPanel hosting at a much lower price compared to martket! Our hosting plans are designed for individuals and small businesses to host their websites and not worry about spending huge cost for setup. If you are looking for Domain Registration and Website Hosting service, you have just gotten to right place!